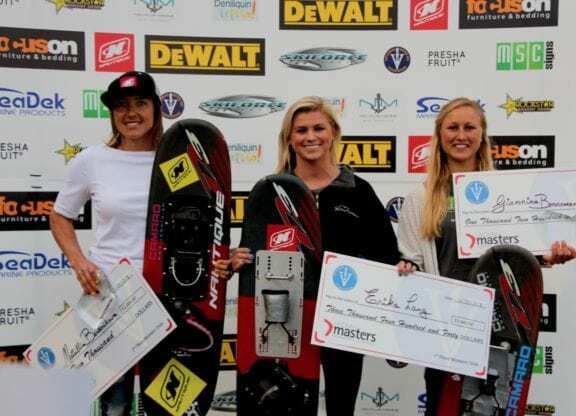 The event started out with women tricks and Erika Lang was first off the dock. With two solid standup passes, Lang set the pace. 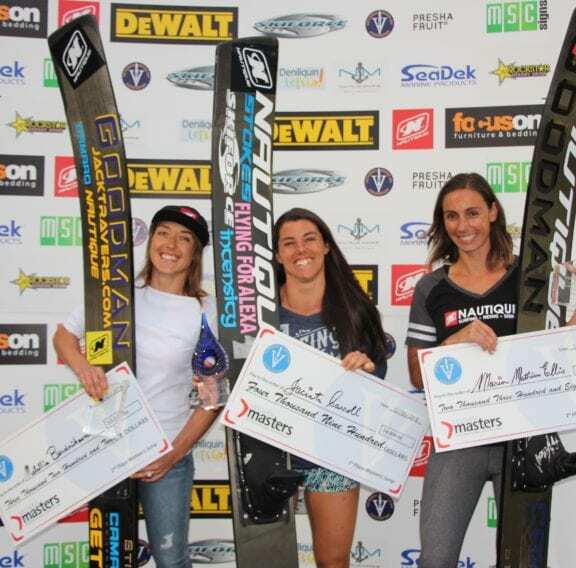 With the mounting pressure, many skiers tried to perform their hard trick runs, causing some to fall early, such Whitney McClintock and Natalia Cuglievan. Natalia Berdnikava and Giannina Bonnemann both impressive the crowd with stand up runs but Erika held onto the win with 9,240. Men’s tricks Jimmy Siemers had a stellar performance, rocking two passes but just falling short on his last flip of his hand pass. With 9920 Jimmy left the door open for the next trickers. Siemers was followed by big upsets on early falls from both Pato Font and Franck Desboyaux. Yet, the biggest shock came from World Record Holder Aliaksei Zharnasek, who stumbled early on his 1st pass. Ace was forced to ditch a couple of tricks mid sequence and tried to recover points by adding bigger tricks to the end of his run. Unfortunately, the gamble did not pay off and even the World Record Holder ended up in the water early. Dorien Llewellyn displayed his consistency with two rock solid runs, only losing one big trick (TWLBB=480pt) and ending up with 9740, just short of Siemers. The final was completed when Aliaksei score came through with 9660, giving him 3rd place. 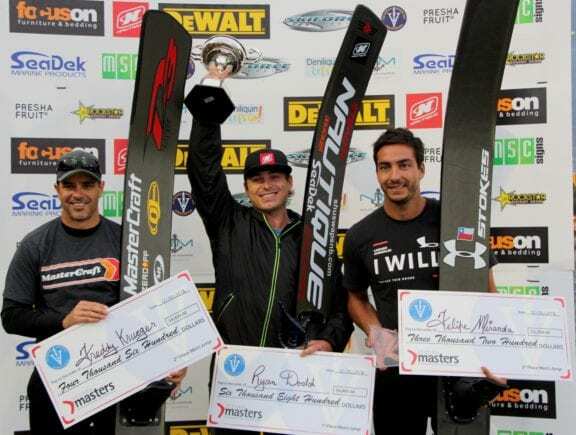 Other notable skiing also came from Martin Labra. The 11-year-old tricked in 6 rounds, standing up every round and improving his score all the way to the end. 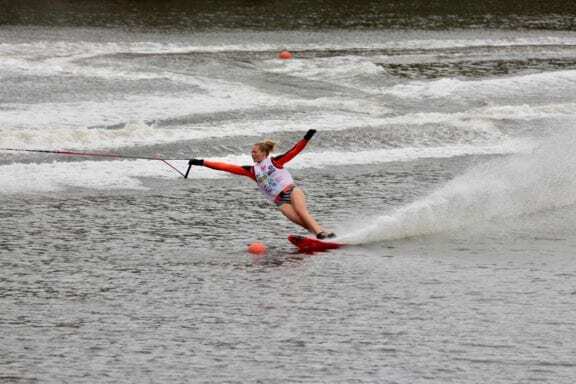 7th Moomba Master Slalom Title, a pretty impressive feat for such a young skier. After two days of low scoring rounds, the Men’s slalom final was primed for a strong showing on Moomba Monday. Stephen Neveu came out of the gate swinging (both literally and metaphorically). He set the tone with a huge 2 buoys at 10.25 meters, the highest score of the tournament and only one buoy shy of the course record. Young guns Thomas Loft and Joel Poland showed glimpses of excellence during their final sets on the river, but had to settle for scores at 11.25 after unfortunate falls. As the event progressed, the strong tail current on each skier’s first pass was accompanied by an increasing tail wind. Despite valiant efforts from Will Asher, Benjamin Stadlbaur, and defending champion Thomas Degasperi, Neveu held firm to the lead as both Asher and Degasperi came flying by 2 ball at 10.25. The combined speed from the wind and current was simply too much for them to reach the buoy in time. 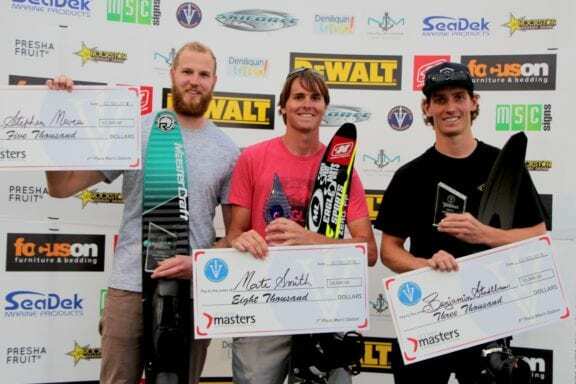 In impressive fashion, Nate Smith’s nerves of steel made him unbeatable once again. Smith looked at ease as he ran 10.75 and strong coming back with a 3 at 10.25. In the end, Benny’s semi-final high score broke the tie with Asher and Degasperi for 3rd, Neveu finished in 2nd, and Smith took home another 1st place victory. The jump event was a chess games for every competitor in the finals. A strong head wind and head current were accompanied by a high frequency of wind gusts. 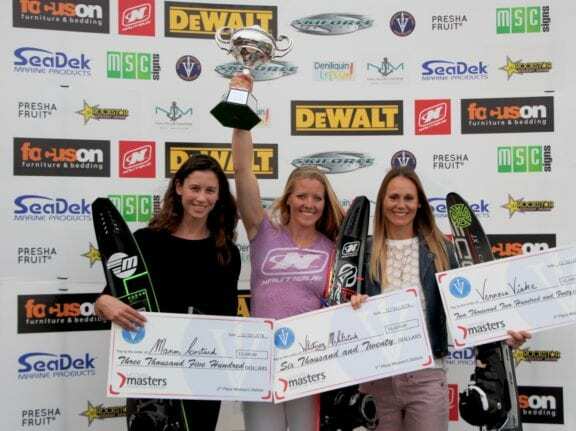 Experienced skiing was on order and Natalia Berdnikava and Marion Mathieu-Ellis were up to the challenge. Each were able to find their timing for a good jump, with Marion flying 171 ft. and Nati landing 2 feet father with a 173 ft. jump. Jacinta Carroll also struggled with the gusty winds but her brute strength from power lifting paid off with a huge leap of 187feet. 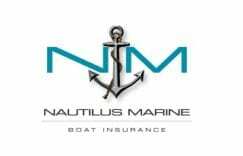 The conditions continued to change sporadically as the men took to the water. 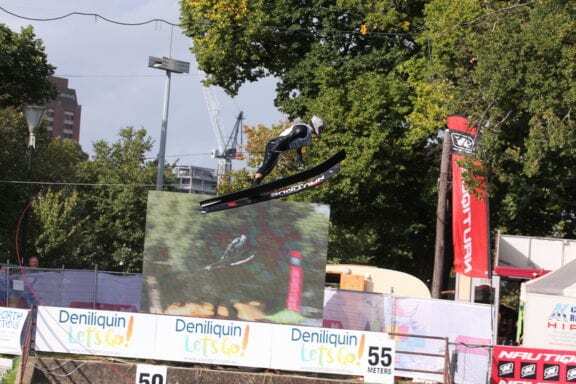 With the timing for the turn to the ramp already being difficult on the Yarra, many jumpers only were able to get one good jump on the board. Felipe Miranda even elected to pass on his final two jumps, his first jump of 213 ft. being his only score. Yet that is the beauty of the jump event, you only need everything to fall into place once! The rivalry of Freddy Krueger and Ryan Dodd continued to intensify every day. Freddy’s normal fashion would be to knock one out of the park on his 1st jump but he failed to find his rhythm on his first two jumps of the finals. Still missing some speed but getting his legs on his 3rd, Freddy left the door open for Dodd. Still, 217 ft. is respectable jump. Ryan tried to ease into his jump set for a smooth controlled win, but he came up short twice, realizing that it was not so easy out on the water. With everything on the line and one jump, Ryan came into the bottom of the ramp with tons of speed and booted a 225 ft. jump for one incredible final. But wait, it’s not over, night jump is on. Top 6, Claudio Kostenberger, Scott Ellis, Rodrigo and Felipe Miranda, and of course Freddy and Ryan all begin with 3 jumps in the dark off a 5.6 ft ramp. Felipe, Ryan and Freddy all posted solid scores and were able to move onto the next two jump round. 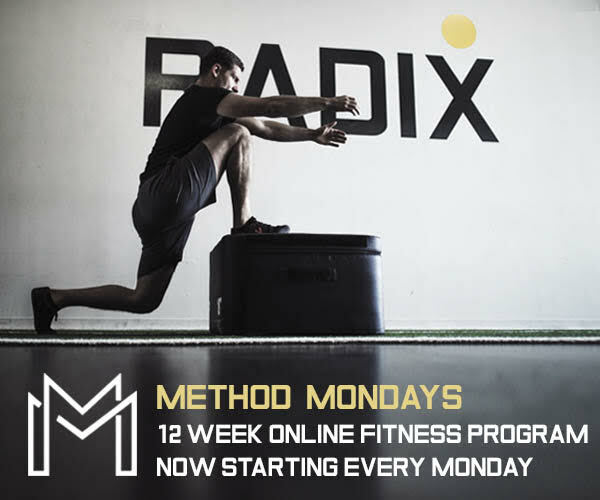 Ryan and Freddy would get one more chance to challenge each other as they proved to be the last two left standing for the one jump, head to head finals. Freddy was on the water first and nailed a 216 for redemption from day jump. Ryan dug deep and once again had crazy speed into the bottom of the ramp, but couldn’t find his legs and came up short with 204. The Moomba Masters never leaves the crowd disappointed. This event is like no other in the world. 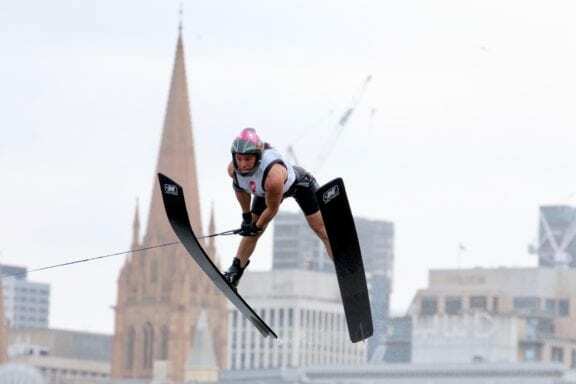 With skyscrapers in the background and crowds in excesses of 15,000 sitting on the banks of the Yarra River each day, skiers from around the world consider it one of the best, if not the best, events every year. 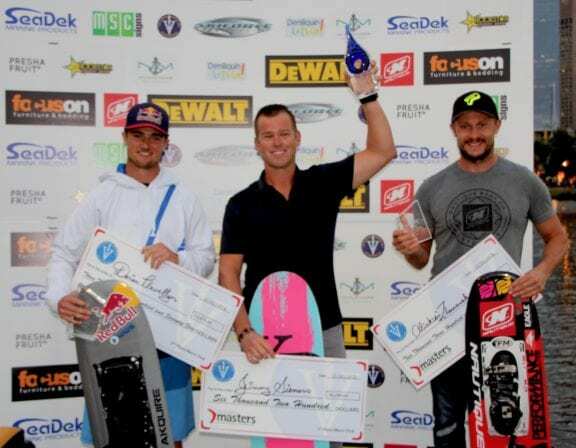 Crowds are memorized by the breath-taking performance from the greatest skiers and wakeboarders on the planet. 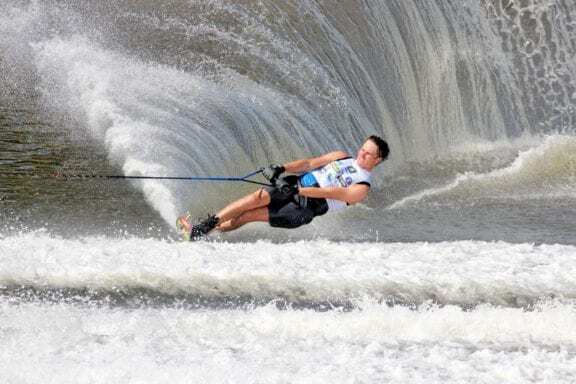 If you are a water sports enthusiast, Moomba is one event you must put on you bucket list. Melbourne is one incredible city and the Australians are some of the friendliest people on the planet. So plan now to join us next year at the 2019 Moomba Masters!